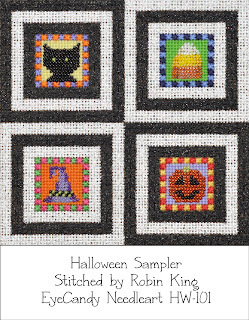 I stitched this Halloween Sampler from EyeCandy Needleart. 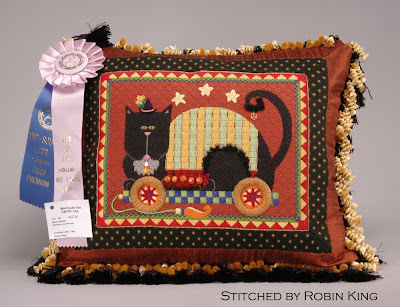 Beads, Burmilana and Kreinik were all it took. So cute. Ada is an awesome designer. 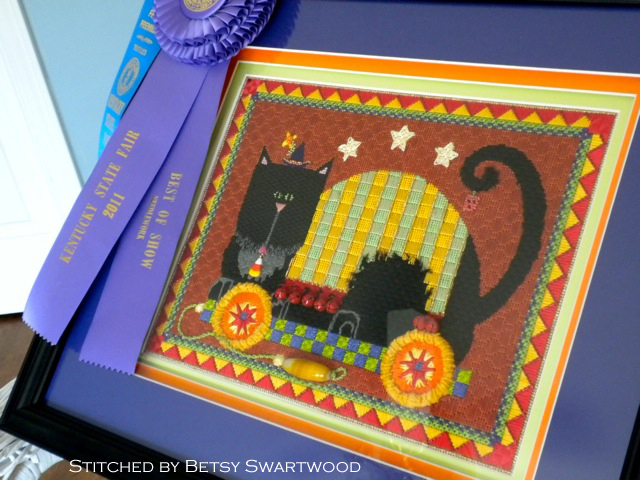 I made this Halloween Stained Glass picture frame. It would be perfect for a photo of one's grandkids dressed up for Halloween, don't you think? It has a glass beveled stand and a 4" square bevel for the photo. 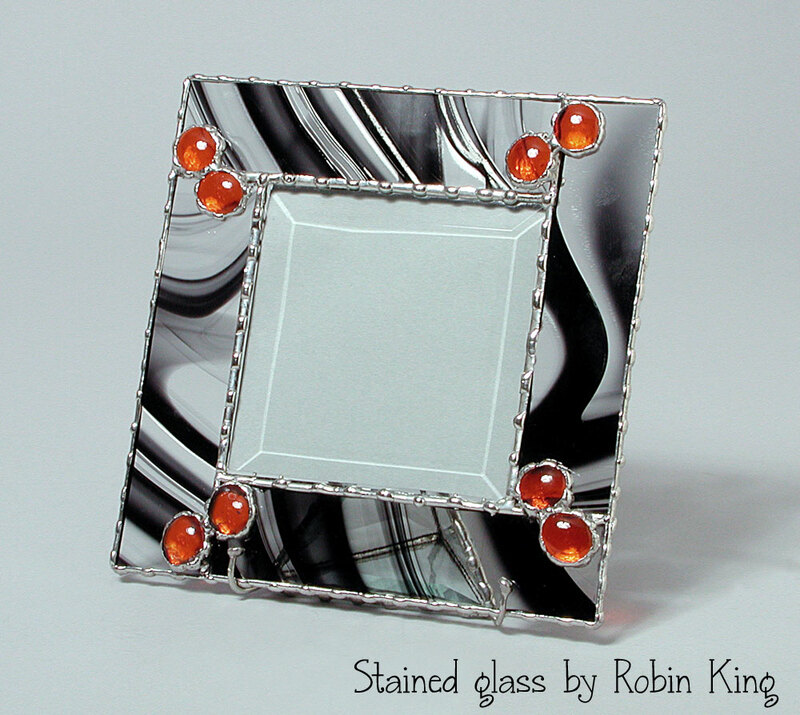 One of these days I will have an Etsy.com listing for my Stained Glass work. Now... let's talk about the Nutcrackers and Smokers! (Yes, I've got it bad.) 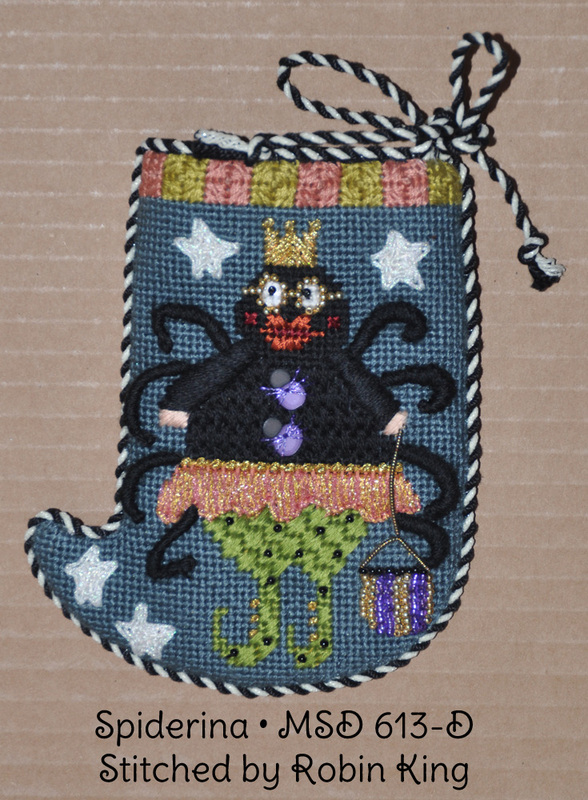 Christian Ulbricht is my preferred Nutcracker designer, but I do have some from other designers, too. And, when I found a Nutcracker Witch to stitch... ooohhhwweeeee! Life got even better. This concludes my Halloween 2011 Show & Tell. The Creepy Characters are certainly in good company, don't you think? I can't wait to stitch my next Halloween piece. So many choices; the designers have wonderful new canvases as well as my existing stash is over-flowing. 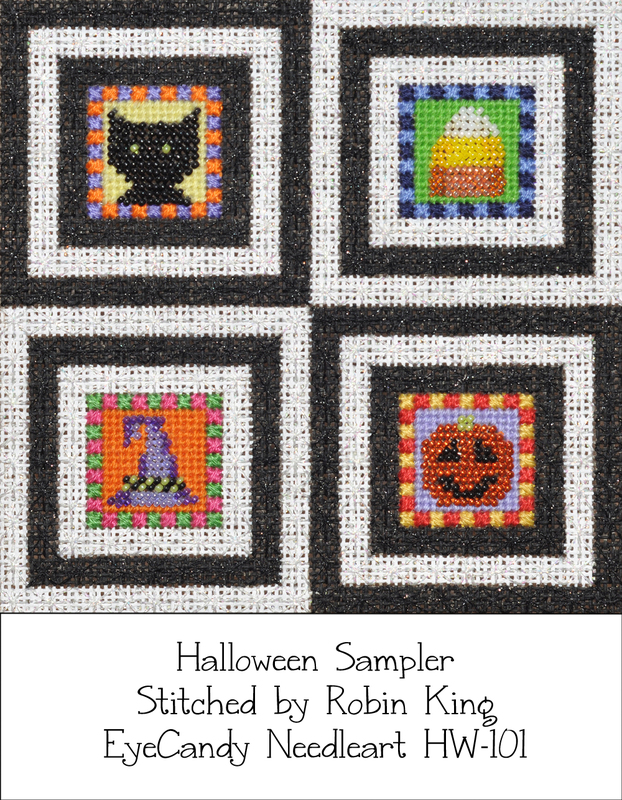 Hope I have inspired some needlepoint for your future Halloween. 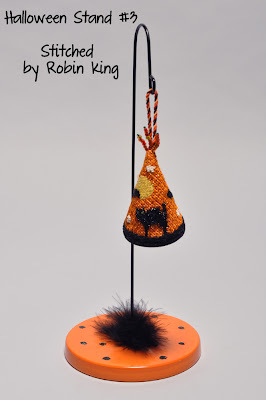 Mini-Stockings are not just for Christmas! Melissa Shirley Designs made them for Halloween, too. Like I mentioned before, these might not be listed on Melissa's current website but she says she can paint any design from the catalogs. 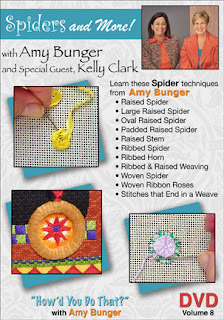 I stitched these during Amy's canvas enhancement classes on Thursdays. They were finished by M's Canvashouse in Lexington, KY. 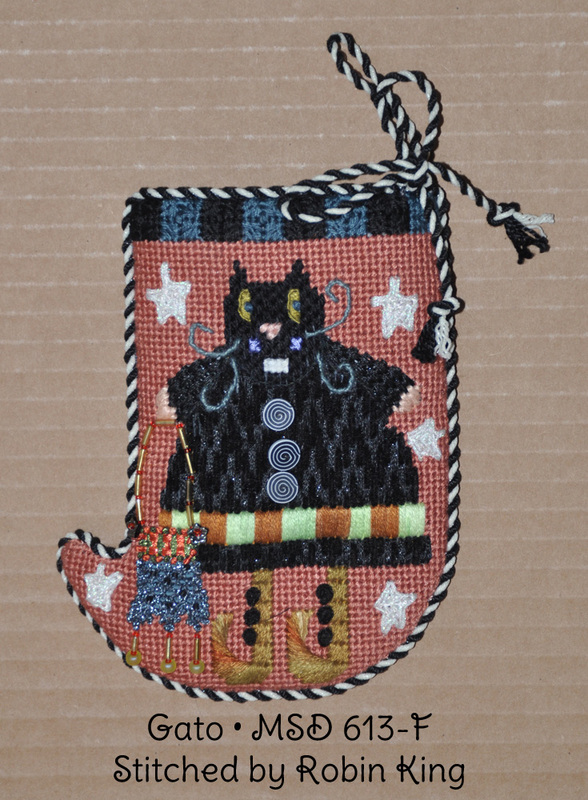 They all have the same Black/White Glow in the Dark Kreinik trim. Each stocking has a different color moire fabric backing. They all have an opening at the top like a real stocking. I put them on the Black Feather Wreath to showcase the collection. 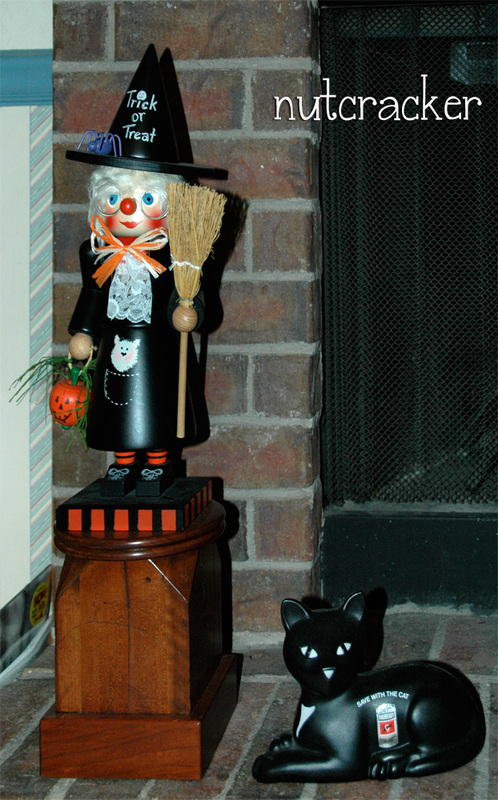 Notice the Black Cat Face... to the left of the wreath? 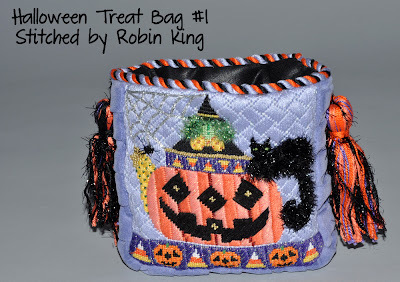 I saw an episode on Martha Stewart where they were making treat bags out of paper mache. Their technique was my inspiration to make this Black Cat Face. Sweet! Halloween will be upon us soon. I'll be back with the Halloween wrap-up. Hi Everybody... Robin here... in Montgomery, AL. Today was the first day to teach at The Needle Bug. The tables were set with canvas, threads, and accessories. Both breakfast and lunch were served. It was Southern Comfort at its best. 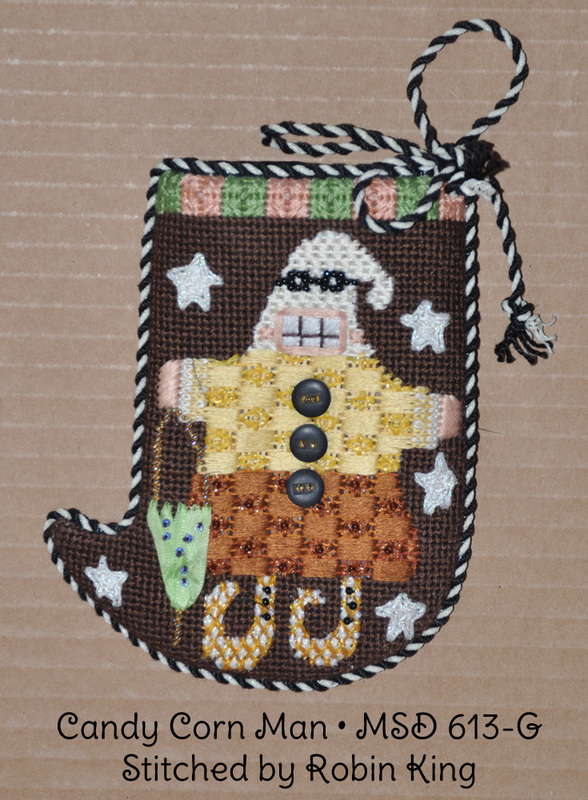 Meri M. brought in her recently finished stocking for her son's dog, Traveler. Soon Meri's son and wife will be new parents. 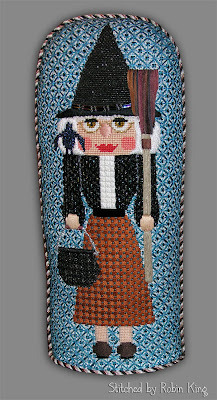 Meri stitched a stocking for Traveler before all eyes were focused on the new baby. Lucky Traveler. Leigh designed this canvas for Meri. 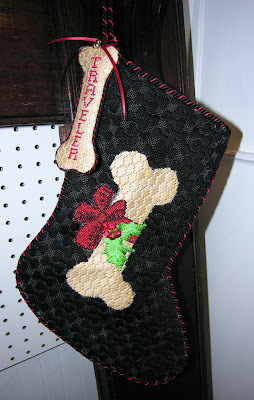 If you need a stocking for your pup/grand pup... give Leigh at The Needle Bug a call. Love the Dog Bone darning stitch and the Dog Name Tag. Yes, Traveler is a lucky dog! After class we watched the World Series/ Game 7. I am sorry for those who didn't enjoy the outcome. Next year, right? We went out to dinner, Young Barn Pub and Oyster Bar. Very nice and attentive waitress. Tonight's cocktail was the Blue Moon beer. Love the Orange garnish. 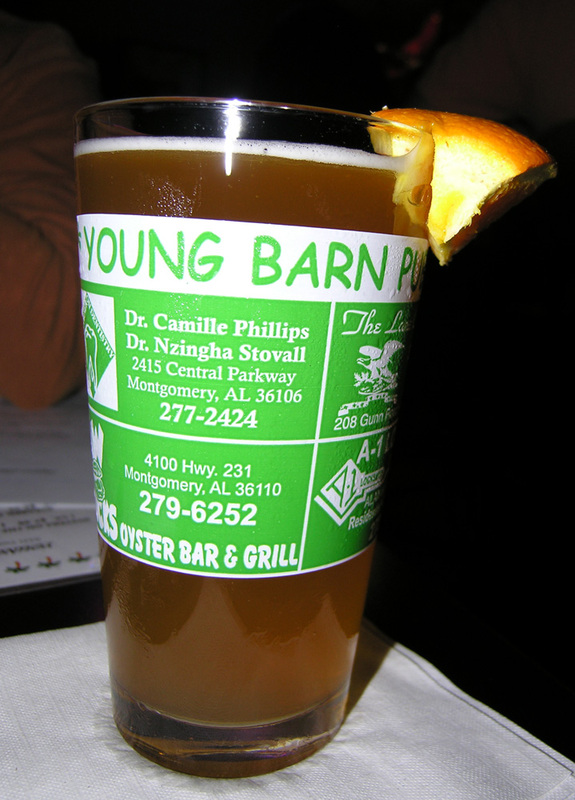 Now, that's how to get your Vitamin C! 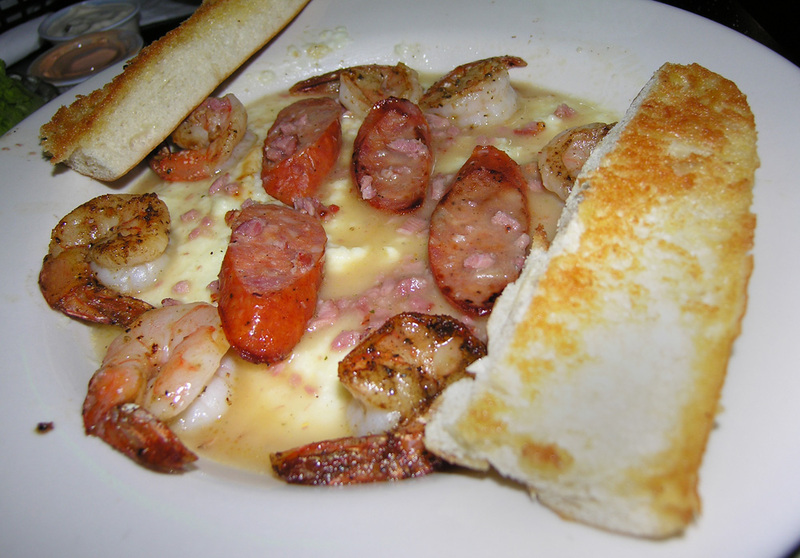 Dinner was Alligator Sausage with Shrimp and Grits... and a dinner salad on the side. Nice. I thought I was visiting Charleston. Good Eats. 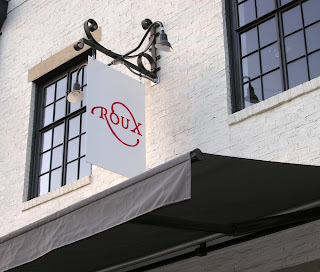 Tonight's dinner was at Roux restaurant. It was a happening place to be. Guess what was on the menu? 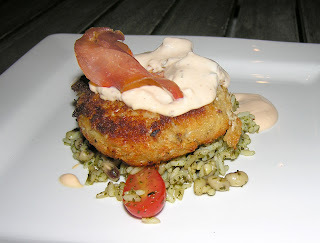 Crab cakes! I thought they were long-gone from the Baltimore days. Yippee! So tasty. The weather was perfect. Thanks to Leigh and guests for the wonderful Alabama welcome. Halloween Festival 2011 continues. Here we go! Here is my Halloween Cat Pull Toy from Melissa Shirley Designs (MSD 700). I first saw this canvas at M's Canvashouse when I was visiting my family. I knew I had to have it! 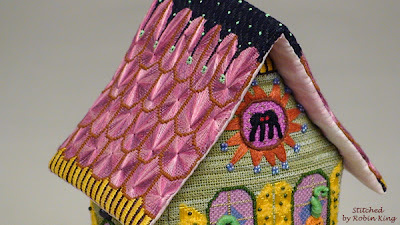 Then, I came home and worked on it during Amy's canvas enhancement classes on Thursdays. I had it finished at Marlene's/San Francisco. Love the fringe. 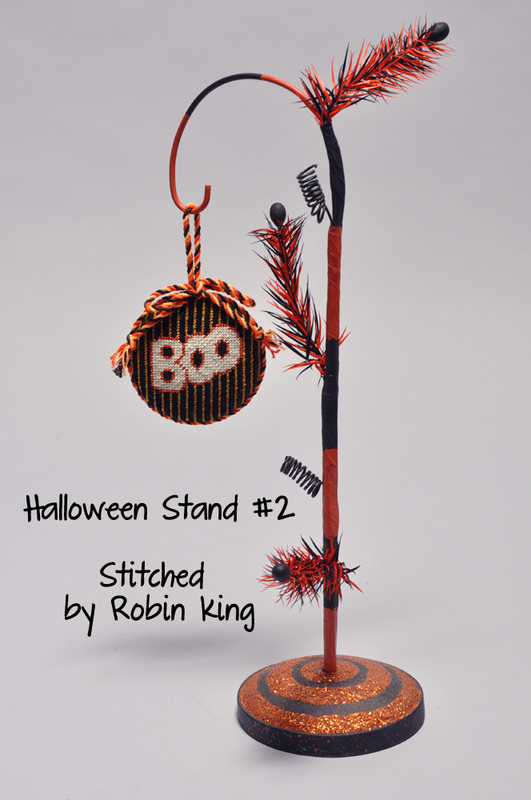 I have also written the Halloween Crow Pull Toy (MSD 700-B) stitch guide. 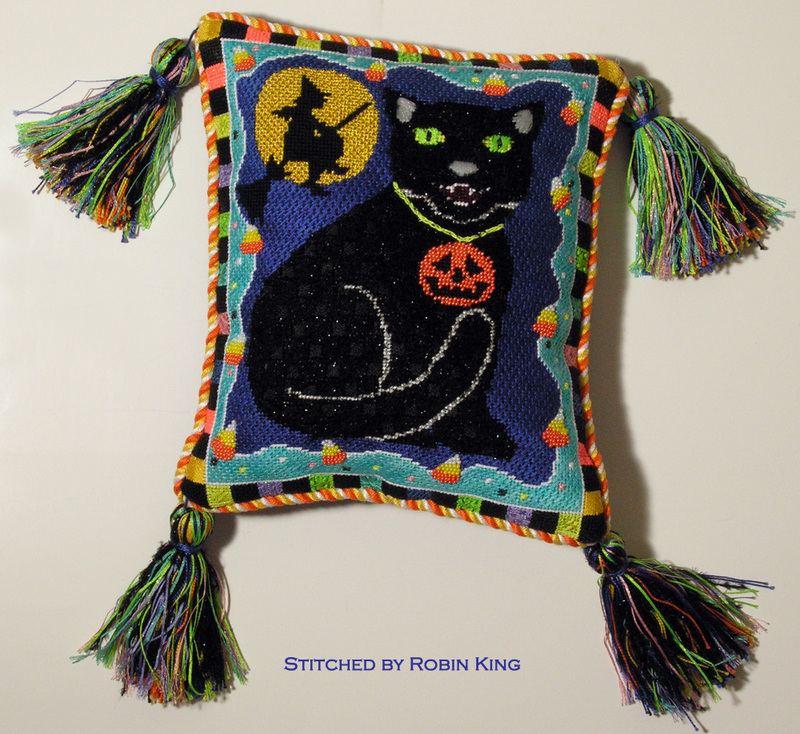 I haven't stitch it myself, but did use many of the same stitching techniques from the Halloween Cat Pull Toy. Both canvases were on 13 mesh, available from Melissa Shirley Designs. LOVE her designs. 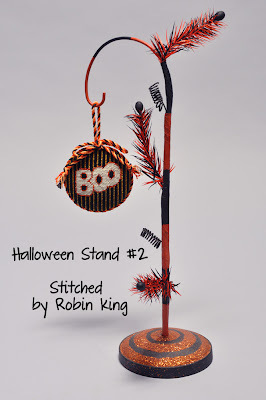 Oh, look... you could do the same pumpkin treatment like I did for the Tall Sickly Green 3-D Wacky Halloween House. The Pull Toy Wheels technique are also in DVD #8, Spiders and More! Well, that's all for now. Next time will be the Halloween Mini-Stockings. Let's continue with my Halloween Showcase. Yes, I know... Day 5, but I really ♥ Halloween. Here is my Tall Sickly Green 3-D Wacky Halloween House. It is from Melissa Shirley Designs (MSD 576-B). 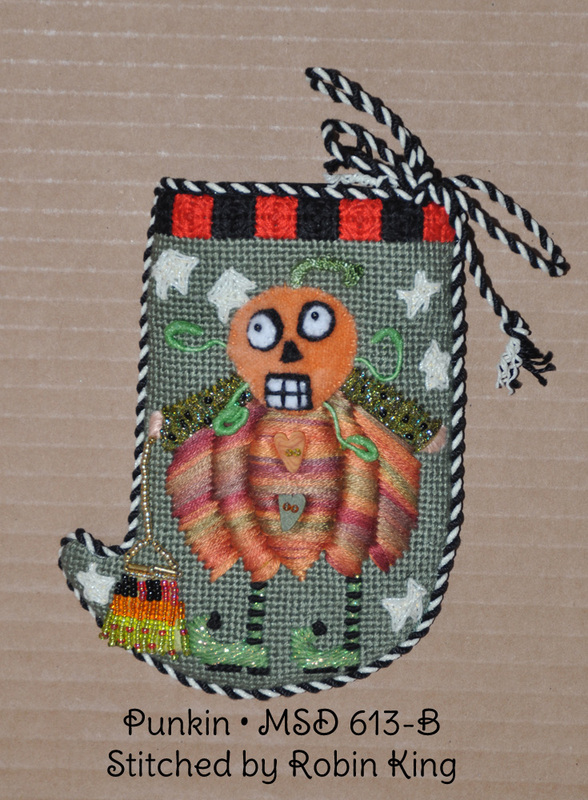 I stitched it during Amy's canvas enhancement classes on Thursday nights. Once it was finished, I gave Amy the class notes from which she assembled her Home Study project. 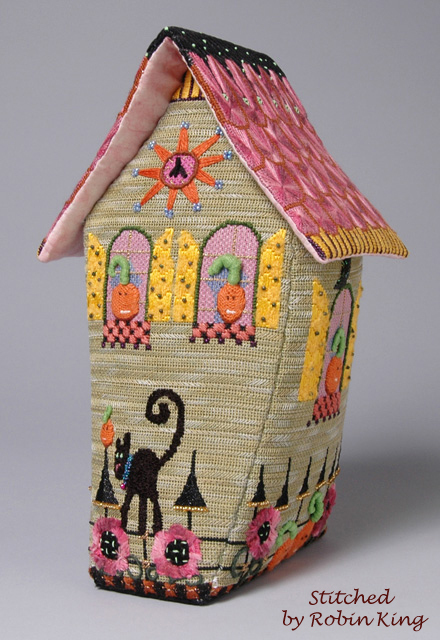 I also became comfortable with the "barely there" coverage for both the house walls and the roof shingles. Notice the overdyed threads did all of the work! Well, that's all for now. I've got more to Halloween to show you! Halloween Treat Bags. I love the idea of taking a canvas and having it made into a 3-D piece; lined and weighted. 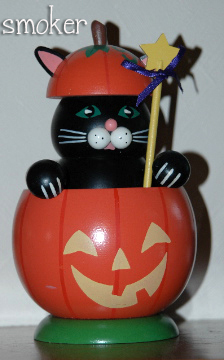 Ready to join your other Halloween decorations. 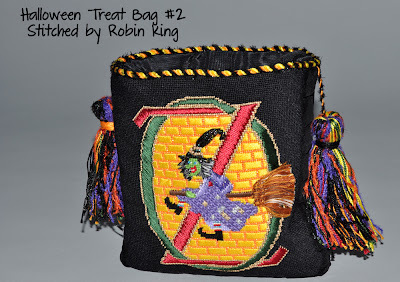 Love the tassels, too! Each of these Treat Bags were finished by M's Canvashouse in Lexington, KY.
My first Halloween Treat Bag was made from this Shelly Tribbey canvas. 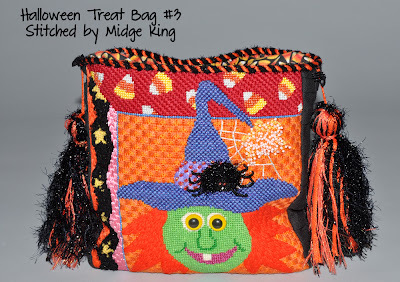 My third Halloween Treat Bag was a gift from my sister, Midge. She stitched this Renaissance Designs canvas and gave it to me for a Christmas present. It had been on display at M's Canvashouse. I admired it every time I visited their shop... never knowing it would be mine. 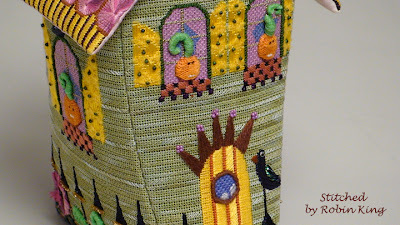 I love the beaded-on-wire Spider Legs. 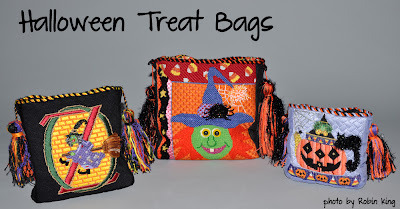 Treat yourself to a Treat Bag. I'd love to hear from you. 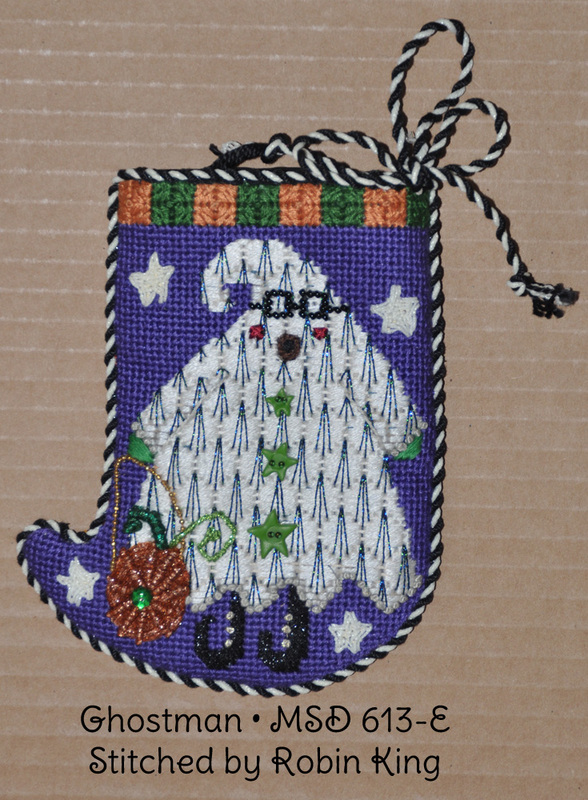 The theme of Halloween decorations continues: Needlepoint Ornaments from my past. My needlepoint stitching was whipped into a frenzy when my youngest sister, Midge, worked at M's Canvashouse in Lexington, KY. She told me about the wonderful painted canvas designs and that I would really enjoy this kind of needlework. How right she was! 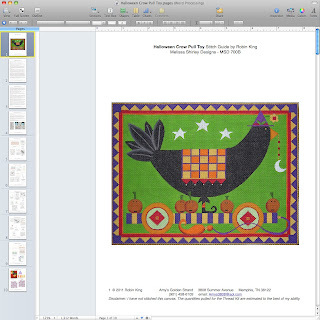 Who knew needlepoint would be a perfect way to further enhance my Halloween decorations and passion for the season? 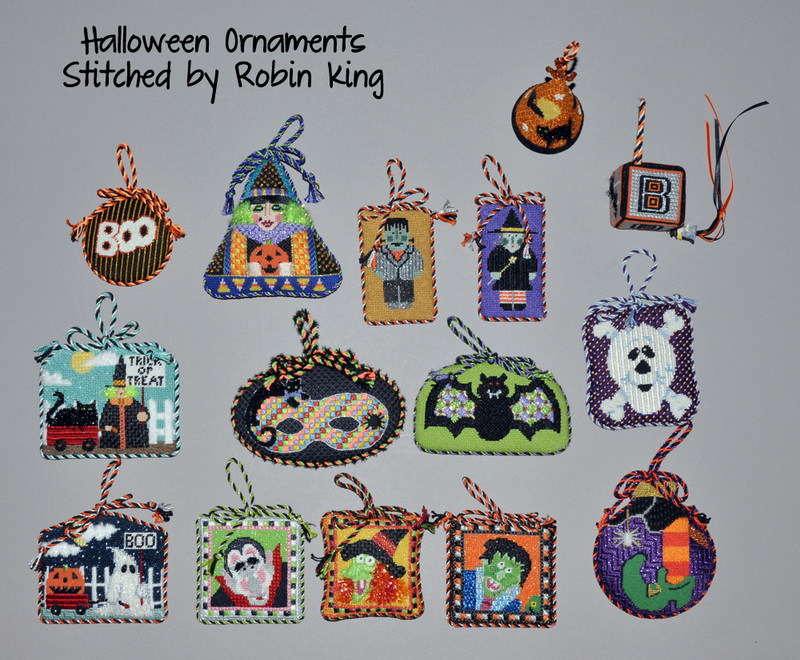 I began stitching Halloween Ornaments. A few of my favorite designers were (and still are!) 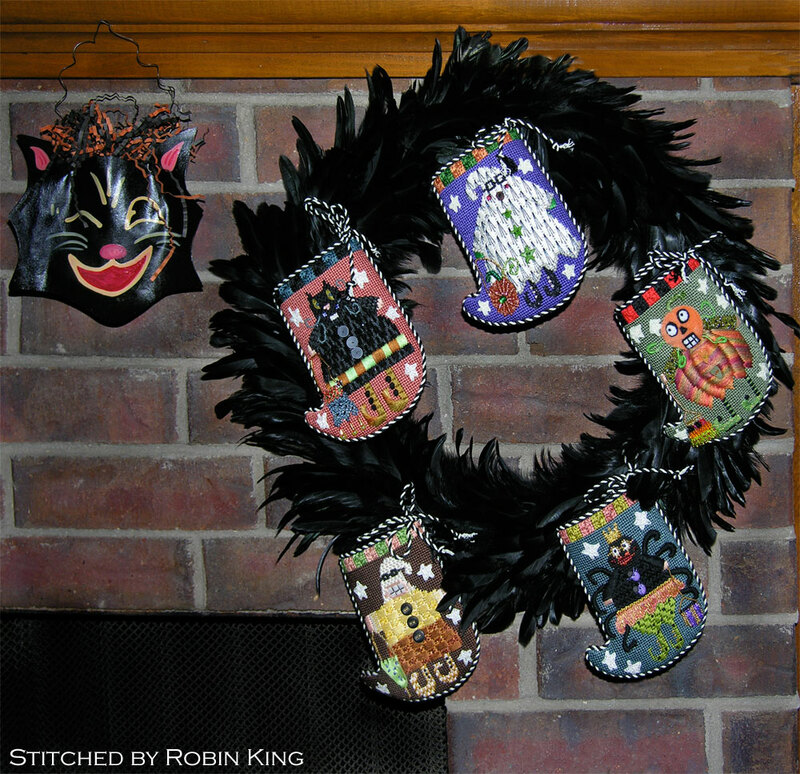 Shelly Tribbey, Kathy Schenkel, Renaissance Designs, A Collection of Designs, Jody Designs, etc... All of these ornaments were finished by M's Canvashouse in Lexington, KY.
Look at the stands I found to hang individual ornaments. 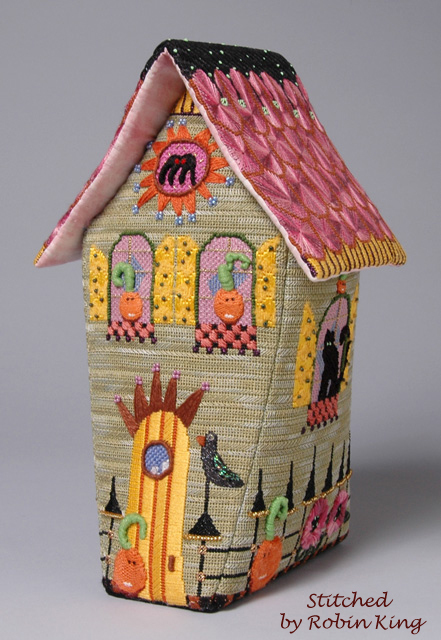 The wooden blocks from Kathy Schenkel are so colorful, don't you think? Ornament Holders are just the right thing to showcase your stitching. 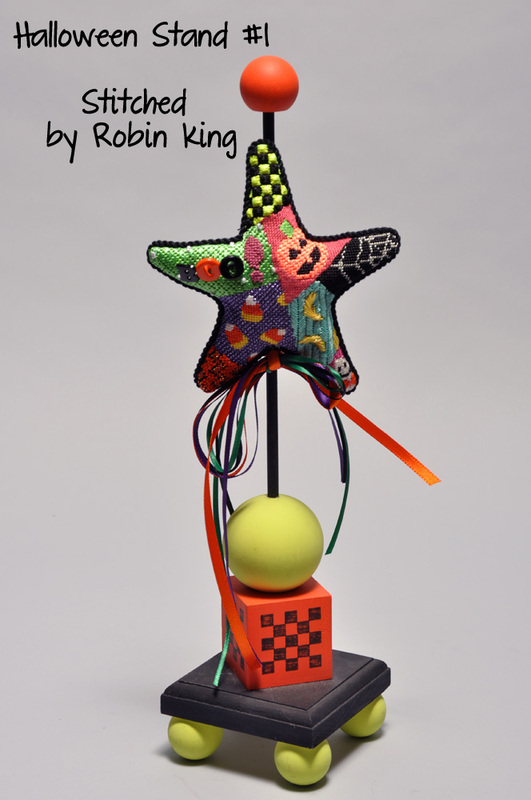 Keep your eyes open for your next showpiece holder. I've had the best luck finding them at fancy florist/gift shops. 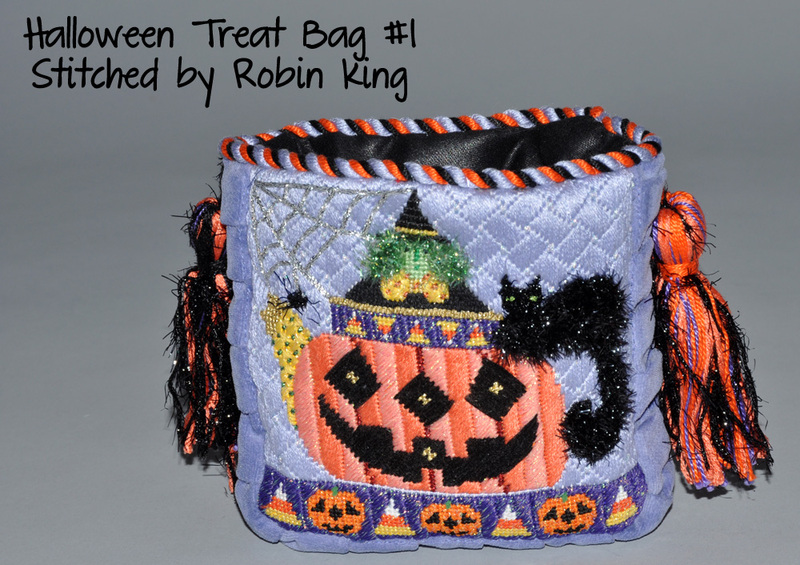 Next up in the saga of Halloween Decorations: Treat Bags! Here's another Halloween piece which I stitched during Amy's Thursday night canvas enhancement classes. 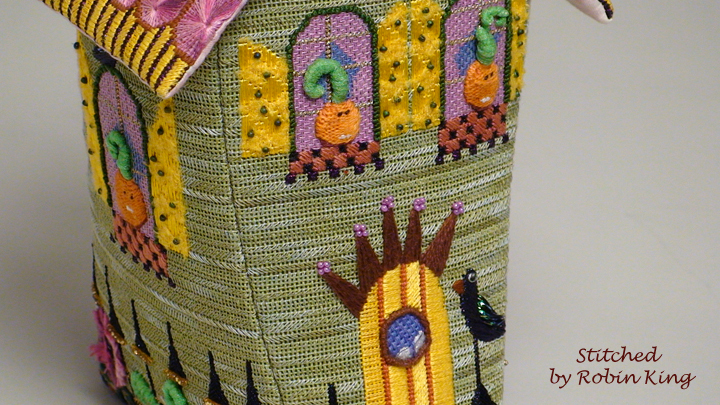 It is from Shelly Tribbey; finishing by M's Canvashouse in Lexington, KY. Love the tassels! Our black cat, Rayo, was the inspiration for choosing the canvas. 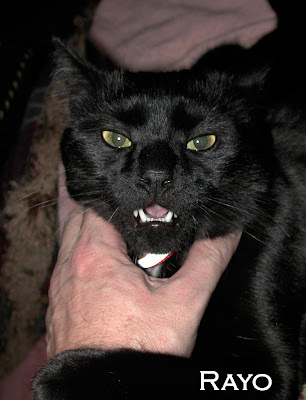 He's a spirited cat but has mellowed over the years. Rayo is now our eldest cat... 9 years old. 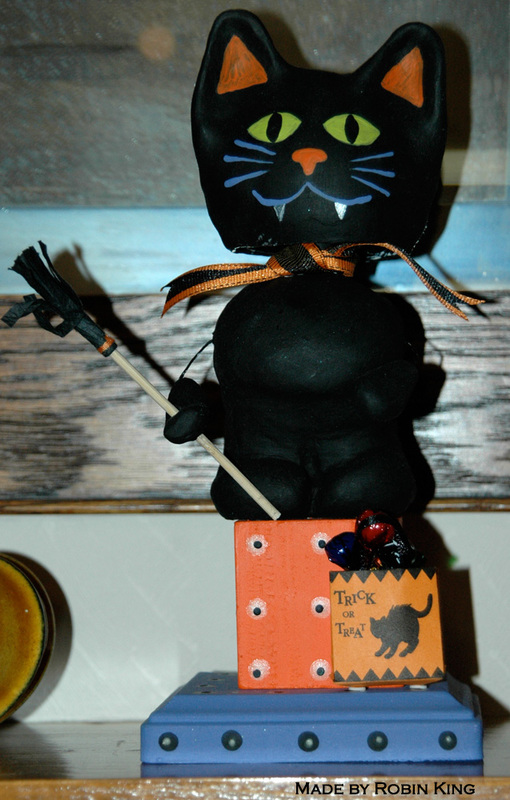 Rayo was also my inspiration for making this Bobble Head Halloween Cat. I saw this idea on HGTV and made it soon after that. It really works, too. 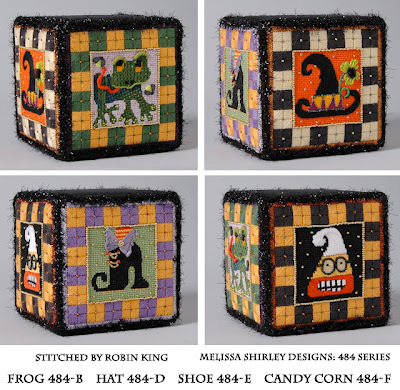 One of my favorites is this 5x5 cube from Melissa Shirley Designs. I loved the designs but couldn't decide which one to stitch. So, I stitched 4 of them. Then, I had them made into a cube. The finishing was done by M's Canvashouse in Lexington, KY. Black Artic Rays from Rainbow Gallery was added along the edges. There is black moire fabric for the top and bottom. 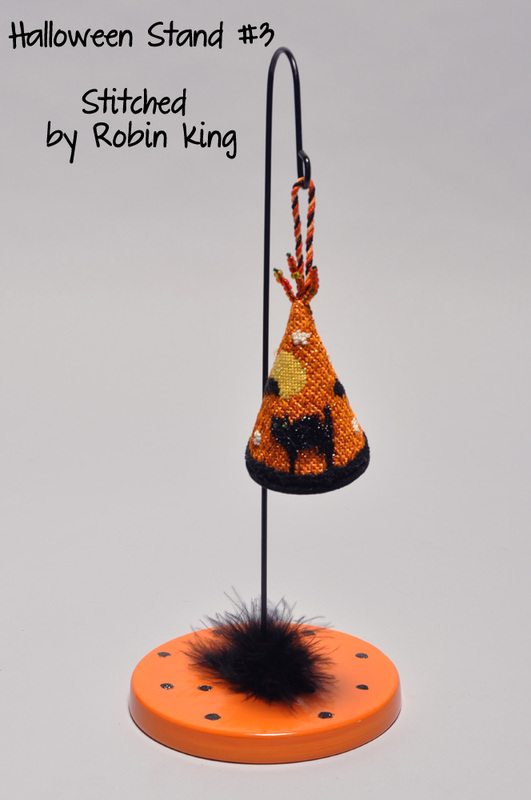 If this doesn't scream Halloween, I don't know what does! Melissa said they don't keep older designs in stock but WILL paint anything in their catalog. These canvases are from the 484 series. 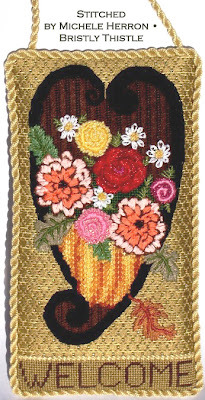 These were stitched during Amy's Thursday night canvas enhancement classes, again... back in the day. But, this idea isn't just for Halloween. Any four/same size canvases can be stitched and assembled into a cube. I've got my notes and can whip up a stitch guide for these, too. 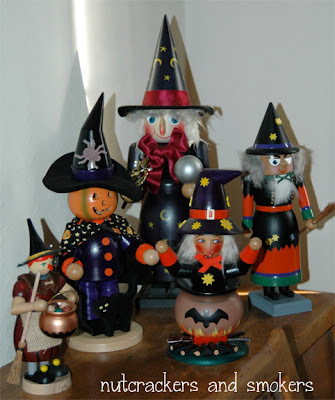 I'll be back with more decorations from my Halloween archives. 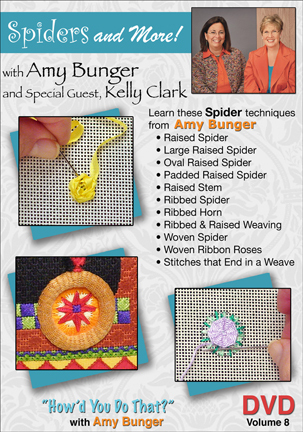 At the end of this month, I will be teaching at The Needle Bug. How exciting it that! I met Leigh at the Columbus / TNNA market this past June. She had heard about me; I had heard about her. When we met, it was like old home week. We were in the NeedleDeeva booth, admiring the Creepy Characters. Leigh said she wanted me to come teach at her shop in October. I showed her the finished Columbus Heart (ND 150G; named because it debuted at the Columbus market) and she loved it. 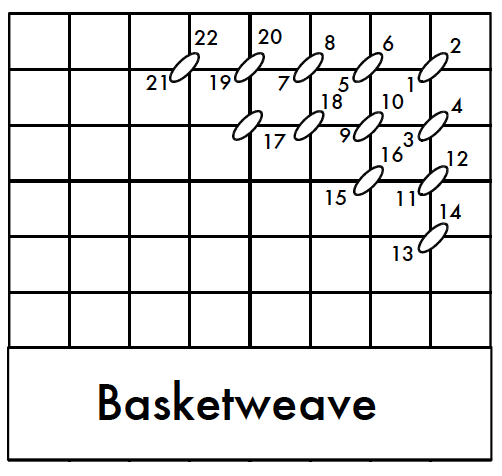 It is a good teaching piece. Crescent Roses. Ribbon Mums. Beading. Getting comfortable about stitching over the painted canvas in order to layer the design. These techniques can build confidence and inspiration for other projects, too. I will be there for 2 days, October 28 and 29, 2011. If you are in the area, or want to take the class long-distance, give Leigh a call. 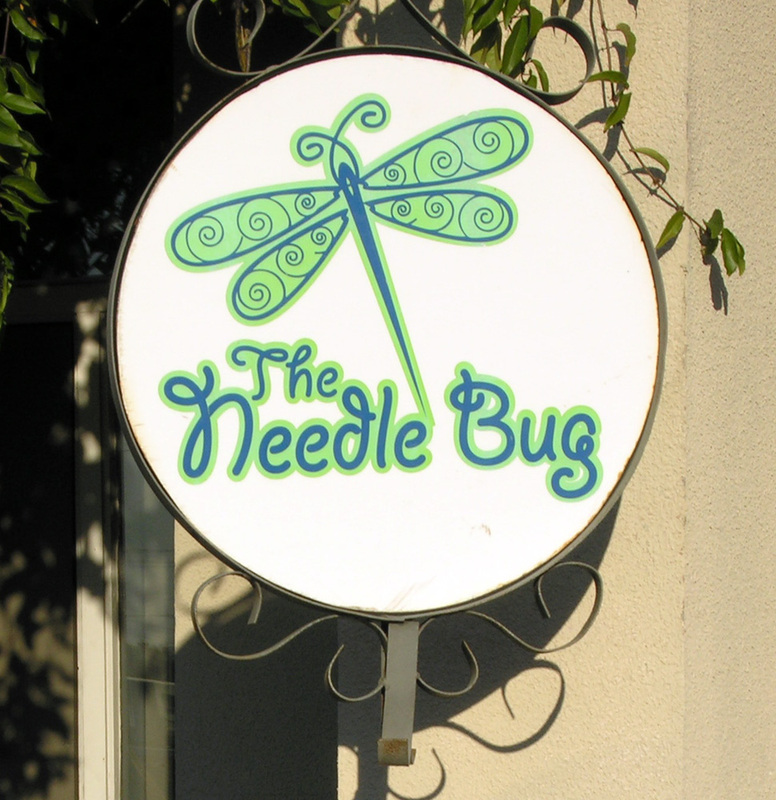 The Needle Bug has true southern charm. You can read the previous blog postings about the Columbus Heart located in the topic bar as well as clicking on this link: NeedleDeeva Heart #150G. 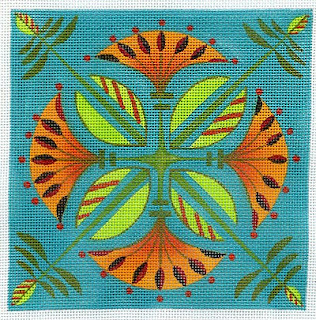 The design measures 3.75" W x 6.25" H on 18 mesh, and comes with my stitch guide. Look how you can finish this canvas. 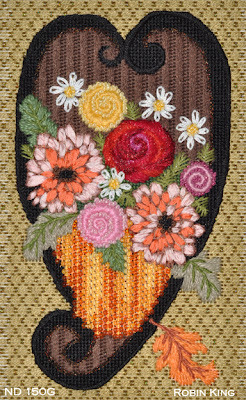 Michele Herron from the Bristly Thistle was in my TNNA class, and her piece was finished with "Welcome" added at the bottom. I LOVE this idea. Thanks for sharing, Michele. I'll be blogging more about my trip to The Needle Bug once I get there. I am so excited for this opportunity to travel, meet other stitchers, share information, and shop! 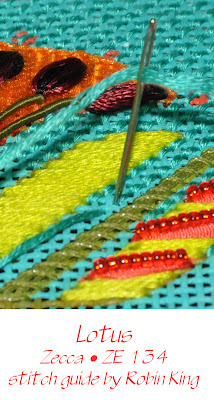 Skip Tent stitch is an Awesome stitch! 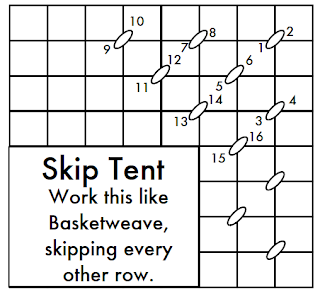 Have I told you I LOVE the Skip Tent stitch? This isn't True Confessions; I'm just talking about an honest admiration for a needlepoint stitch. Perhaps you know it as the Basketweave Twill? Regardless of its name or your locale, it is a wonderful stitch when the moment is right. 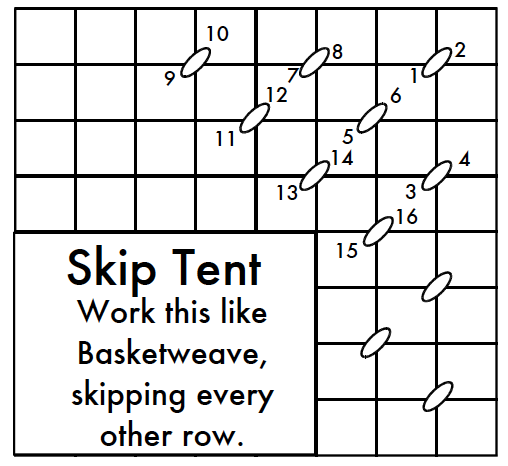 Work it like the Basketweave; in a diagonal pathway, skipping over one canvas intersection when beginning the next row. Look at this photo. 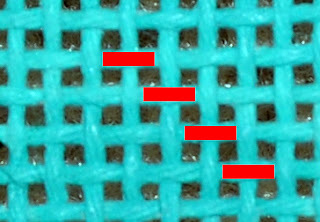 I am stitching the Skip Tent stitch going on the downward/diagonal descent. I am going to have to jump over this "obstacle" and try to figure out where is my next stitch. Gulp! I am stitching the Lotus Squared by Zecca (ZE 134) and writing the stitch guide. I saw it on display in her booth at the Baltimore market. 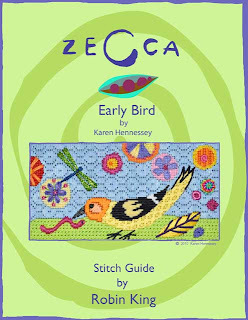 Last year I stitched Early Bird (ZE 107) and was looking for another opportunity to work with Zecca. 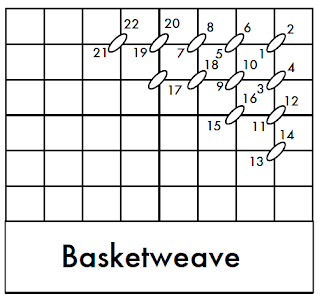 Lotus Squared comes in both 13 mesh and 18 mesh; both are 6" x 6". I love the colors of this painted canvas. 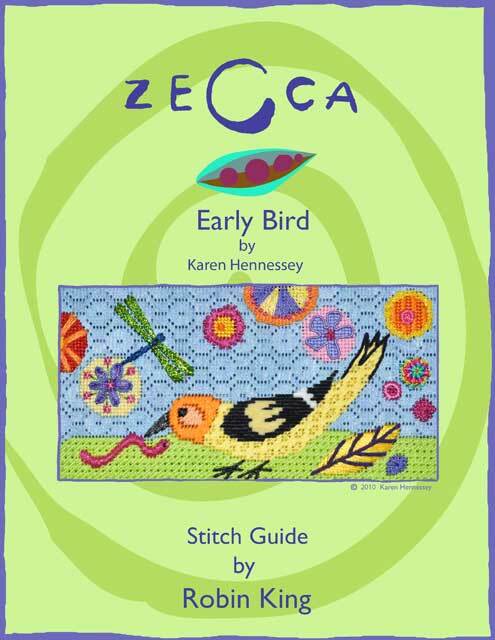 Zecca has an eye for botanical/nature designs, don't you think. The Beads, Kreinik, Ribbons and the DMC Memory Thread give just the right touch of texture. I loved stitching this piece on 13 mesh. I believe you will, too.